On October 1st 2016, I invited a group of friends to join me at the Disneyland Park and California Adventure Resorts. We enjoyed the day strolling the parks, riding the rides and dining on fantastic food. 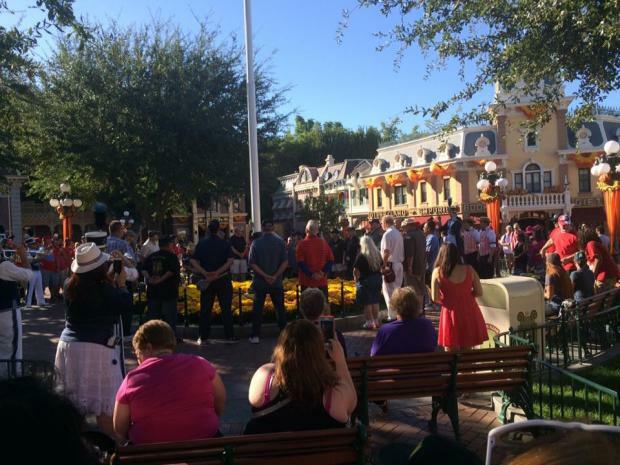 Every day before sundown, Disneyland performs a Flag Retreat ceremony at the Town Square, with a flag lowering, patriotic music, and special recognition of veterans. The Disneyland Band and Dapper Dans vocal group marches to the front of Main Street to perform a number of Americana tunes. Disneyland Park Color Guards then lower the American flag as the band plays "The Star-Spangled Banner" in a very respectful ceremony. Though this 20-minute event (including the band's march down Main Street) has been happening for years, it has enjoyed a larger audience in recent years because of its patriotic feel. Members of the Armed Forces are encouraged to participate, and are called up to be honored by branch. Among the invited participating Veteran's that day were my friends Pete SalaZar and Mark Emmich. To my knowledge, most other theme parks and resorts do not honor veterans in this way. I continue to be impressed as well when I am reminded that this ceremony takes place EVERY day at the Disneyland. What a way for Walt Disney to give back to the men and women who have given so much for our nation!